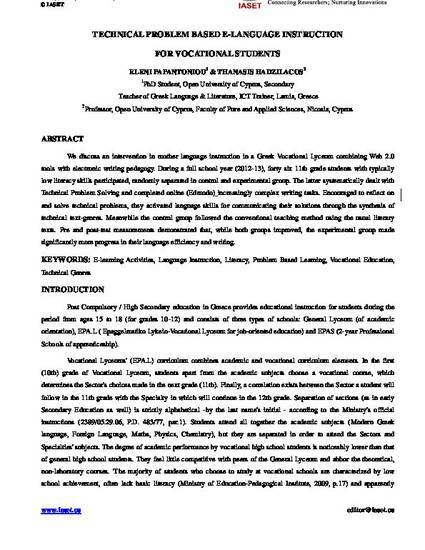 We discuss an intervention in mother language instruction in a Greek Vocational Lyceum combining Web 2.0 tools with electronic writing pedagogy. During a full school year (2012-13), forty six 11th grade students with typically low literacy skills participated, randomly separated in control and experimental group. The latter systematically dealt with Technical Problem Solving and completed online (Edmodo) increasingly complex writing tasks. Encouraged to reflect on and solve technical problems, they activated language skills for communicating their solutions through the synthesis of technical text-genres. Meanwhile the control group followed the conventional teaching method using the usual literary texts. Pre and post-test measurements demonstrated that, while both groups improved, the experimental group made significantly more progress in their language efficiency and writing.